A quietly powerful examination of a young rodeo cowboy who suffers a traumatic head injury which threatens his career, and the struggles he faces to hold onto his dreams. Written and directed beautifully by Ms. Zhao, who lets her actors’ reactions communicate more than the sparse dialog can and captures the emotions in their faces and through the South Dakota landscapes where they live. Spiritual, poetic, delicate, profound and so authentic, this is a striking artistic achievement and one of my favorite films this year – a Must See. The story is fiction grounded in truth. Lead actor Brady Jandreau (Brady Blackburn) was a rodeo rider who suffered the head injury depicted in the film, and personally had to deal with the loss of an identity based in his rodeo life. Zhao had met him before his injury and was trying to develop a film around him. Once the injury happened, she felt she had the story she was looking for, wrote the script and shot the film around 5-6 months after Mr. Jandreau’s injury. No less a character than the people is the majestic landscape around the Pine Ridge Reservation in South Dakota. 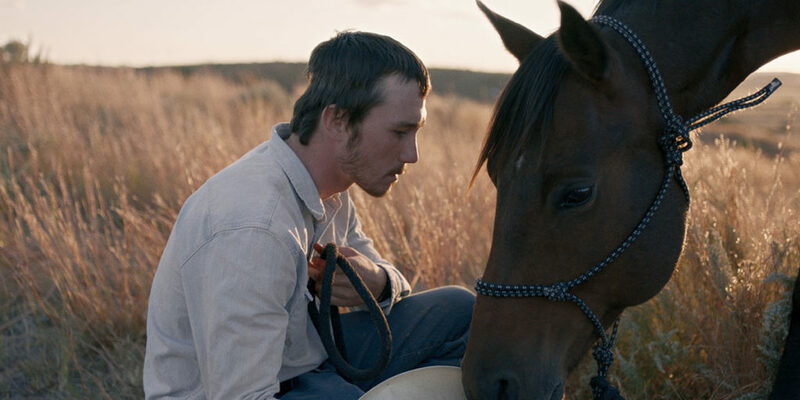 The dawn sky, rolling fields of grass, rugged canyons and distant peaks all speak into the film’s tone and the main character’s emotional state. It’s a beautifully shot film by cinematographer Joshua James Richards, part of a ridiculously small crew for the wonders they achieve. What stays with me most is the authenticity of Brady’s personal struggle to see himself as valuable in spite of his identity being so wrapped up in a singular purpose. Zhao doesn’t sugarcoat the experience, nor sentimentalize the people and community in which Brady navigates. Even though sometimes watching the process felt like getting gut punched, there is a sense of hope that Brady can succeed at redefining himself and what happiness is. That’s something I want to hold onto. This entry was posted in Cinema and tagged Cinema, Must See. This makes me want to see this film! And not just for the horses and beautiful scenery. 🙂 It looks really good and is now on my (very short) list. I also really like Joseph Gordon Levitt. Thanks, Jorge! Lis, I think you will really like it, even though there might be a couple of scenes that are hard to watch. Brady is a great subject, and it turns out, a very good actor, even though he’s not a pro like JGL. Let me know what you think after you see it. Mine is a basic four star ratings system but I use these descriptive categories instead of stars. I chose this mostly out of a desire to be helpful to those who ask me what I recommend. It combines my sense of enthusiasm about the work with whatever merits I think it has. *The Don't See category roughly equals zero stars, and exists to indicate that I think the work isn't worth my time, and perhaps yours.